It can be tough to hold still, their feet feel peculiar as they walked down from my shoulder to my hand having climbed onto me from a post. Somewhere between a tickle and a scratch, their little toenails searched for traction. Earlier, when one landed on Hannah, she jumped and screamed. To them I was no more than a human path to the food, and I couldn’t decide if they were cute, because they are small, furry animals, or if they were instead sinister or malevolent. There is something disturbing about having squirrels climb on me, rather than on the trees. I watched the girls, with their own crowd of fluffy tails surrounding them, and saw the same quandary pass over their faces. In Japan, we came upon so many experiences that can’t really be found elsewhere, and travel with children narrows these down further to the obscure. My brother and sister-in-law, having raised their family mostly in Japan, know where to find adventures that delight our daughters. 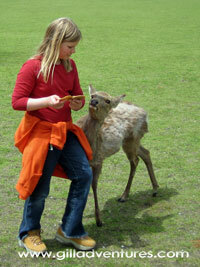 Some of the most memorable have involved feeding animals. 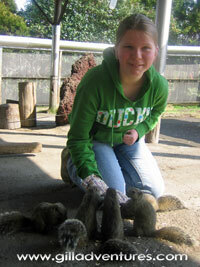 On Izu Oshima Island there is a special park for feeding squirrels. Here, we donned what looks like an oven mitt to prevent our hands from being bitten as they scarf food from the palm. The little creatures are neither tame nor pets, but are fearless and accustomed to eating from the mitts. We couldn’t hold or cuddle them, as we did the younger bunnies in the other enclosure that held the rabbits. Still, we enjoyed feeding them with a sort of twisted fascination. The squirrels seem at once sweet and also fiendish, the child’s doll come to life in a horror movie. Inside the enclosure, the smell reminded me why I have been so adamant throughout my children’s lifetime to saying “no” to rodents as pets. The odor and the end of our 100 yen coins eventually sent us off into the gardens, where we wander through the flowers. Our visit was at the tail end of the camellia festival, and the garden reflected the height of the season, as did the woods and parks all over the island. The girls chattered excitedly about the animals we fed in this place, and talked about others from our last trip while we walked the grounds. 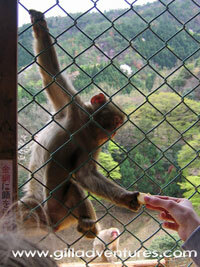 In Kyoto, we fed wild monkeys. We were there during the cherry blossom festival two years earlier, visiting temples and eating octopus balls and squid on a stick by the river. 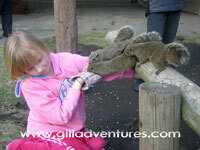 But the highlight for Hannah and Marlie was most certainly the monkey park. 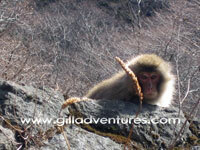 You need to remember that macaques are indigenous animals in Japan. At home, we only see monkeys in zoos, where they are in the cage, and we are spectators looking in. There, in the hills near Kyoto, our roles were reversed. When entering the park, we were told not to bring in our own food, or they’ll smell it and jump on us. This had happened to someone recently, and it did not turn out well for the humans. We were also told not to look them in the eye, as it is a threat. 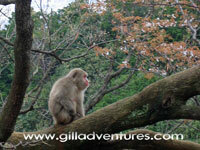 After a short hike up to the overlook, we reached macaque nirvana. We humans entered the “cage;” a building with one side of open wire mesh fencing. Inside, they sell small bags of bananas, apples, and peanuts. These we gave to the waiting hands reaching through the wire, small beggars hoping for lunch. 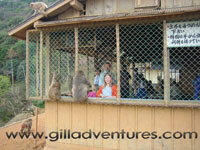 Hannah stepped too close when offering food and a wily monkey snatched her bag of goodies. A tug-of-war ensued. Plastic bags are not recommended diet for Japanese Macaques. Determined not to be responsible for suffocating a monkey or getting bitten in the process, I managed to wriggle it from the unhappy creature. There was a very cute, small one I walked over to look at. I peered into his face until he saw me, and he bristled and stiffened as if threatened. I had forgotten that we were not to look them in the eye. Although he was small, I was rather glad for the wire between us because his look made no indication of backing down or submissiveness. 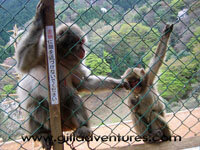 In the future, I would always remember this, especially when passing a macaque without wire between us. Having not been fed by humans who were outside the cage, they were not very interested in us when we walked back out, thankfully, so avoiding eye contact was easy. 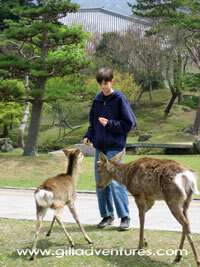 On that same trip we also fed the deer in Nara. There street vendors sell little round crackers baked especially for the deer. 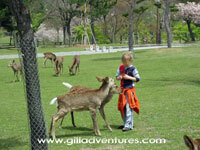 These are small sika deer, not nearly as large or intimidating as our mule deer at home. They can be aggressive, though, if you have food they want. When Marlie tried to save her deer food cracker for a smaller deer she saw, the larger one who had already decided that cracker was his gave her a bruise on her back when he butted her. Fortunately, none of the deer in the city park had antlers when we were there. These deer have all learned to bow, likely from the masses of Japanese tourists who come to Nara to visit the temples and see Todai ji temple, the largest wooden building which houses the largest statue of Buddha in the world. They would always respond to our bow with one of their own, and frequently would bow unasked while begging for deer biscuits. They were answered by showers of giggles and goodies from the girls. Like so many things, the unexpected often creates the most lasting memories. The temples and pagodas lost the interest of the girls after spending days looking at them. Even in Nara’s Todai-ji temple, we spent far more time seeing who could fit through the hole in the pillar behind the Buddha than contemplating his statue. 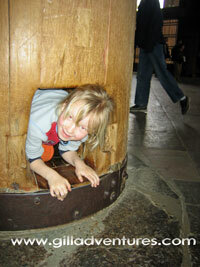 It is said, if you can crawl through the hole, you will reach enlightenment in your lifetime. Of course, only children tiny adults would fit. I guess I will have to save enlightenment for next time. This time around, I’ll just feed the animals.